I can’t wait for my youngest son’s new joke on me. He previously cracked up over my remark that I’d never met a vegetable I didn’t want to roast. Ha. With this experiment, I’m waiting for a similar retort about pickling and jamming. You see, I had a 28-pound blue Hubbard squash on my hands, a long weekend, and an agenda to cook up all of the ingredients in the house before restocking. I think the latter is important since those of us who belong to CSAs, have our own gardens, and/or home-preserve food for later consumption need to be good managers of our food supply. That doesn’t mean you can’t have fun. I get excited about excess since it gives latitude for experimentation. A big squash will do wonders for that, trust me. 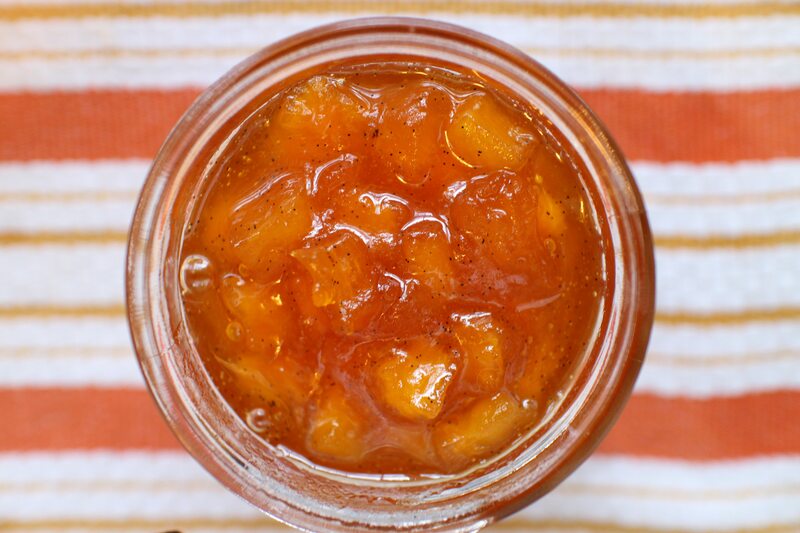 I started looking around for precedents for squash or pumpkin jam, and it led me to Gloria Nicol, her blog Laundry Etc, and her preserving book, Fruits of the Earth. Coincidentally, the same week, Marisa McClellan of Food in Jars linked to both of us. (If you don’t know of Marisa’s blog or her book named Food in Jars, you should.) We three, among many others, participated in a year-long “Can Jam” sponsored by Tigress in a Pickle and Tigress in a Jam in 2010. Tigress had good timing as many of us were either already involved in preserving or motivated to join in. The movement has endured and even picked up speed. While I did not specifically follow Gloria’s recipe for Pumpkin & Vanilla Jam, the idea of adding vanilla to winter squash struck me as great. Recalling last year’s unexpected but spectacular combination of tiny cubes of pineapple jammed with vanilla and rum, I knew what to do. I cut the squash flesh into rectangular logs about 1½ inch x 1 inch x 5 inches and cooked them over medium-low heat in a wide pan with about ¼ inch of water, turning them partway through until the squash is cooked but still firm. After cooling the squash logs, I diced them into neat ¼-inch cubes, tossed them with sugar, a split vanilla bean with the seeds scraped into the mix, and the juice of one lemon with its seeds wrapped in muslin. After letting the squash macerate overnight in the refrigerator, I poured the liquid into a wide saucepan and boiled it to the gel point, less than 5 minutes. My squash yielded a lot of liquid, but if yours doesn’t, add some water. It will mostly boil off and you will avoid too dense a jam. I then added the squash cubes and cooked again until gelled. I added the rum right at the end although I could have used it in the marinade instead. The result was just what I’d hoped it would be. Cut the squash in fairly even pieces (mine were1½ x 1 x 5 inches). Place them in a saucepan in one layer and add water to come about ¼ inch up the sides. Cook over medium-low heat, turning once, until the squash is fully cooked but still slightly firm. Add water if necessary or cook over raised heat until the water is gone. This process takes about 5 minutes. Cool the squash. Cut the squash into neat ¼-inch cubes. Measure the volume of squash (I had 4 cups) and add half that amount of granulated white cane sugar (2 cups), and stir well, being careful not to break up the squash. Split the vanilla bean lengthwise, scrape the seeds into the squash and add the peel to the bowl. Squeeze the lemon and add the juice to the bowl. Tie the lemon seeds, if any, in a small muslin sack and push it down into the squash. Cover (use a crumpled piece of parchment paper, or cover with plastic wrap if your refrigerator contains food that might taint the flavor of the squash). Refrigerate overnight. Stir once or twice to dissolve the sugar before proceeding. Prepare jars for water bath canning. Place a saucer in the freezer to use in testing for gel. 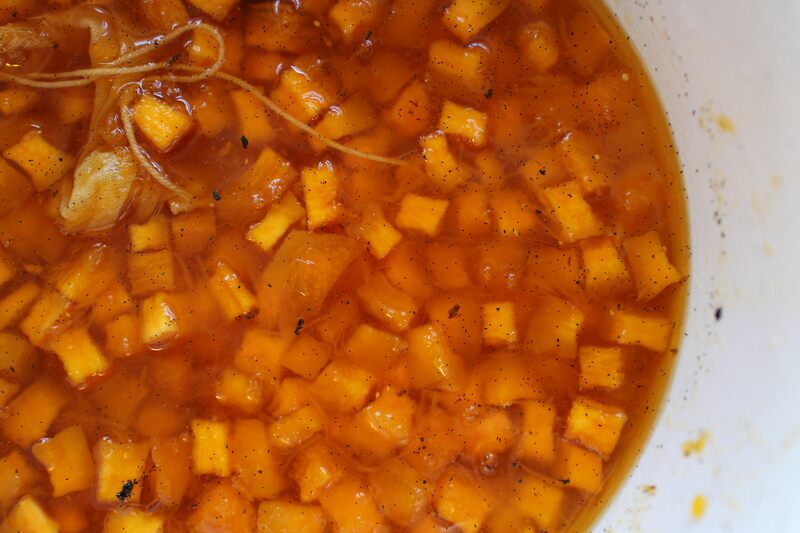 Drain the squash liquid into a large preserving pan, along with any residual sugar and the sack of lemon seeds. 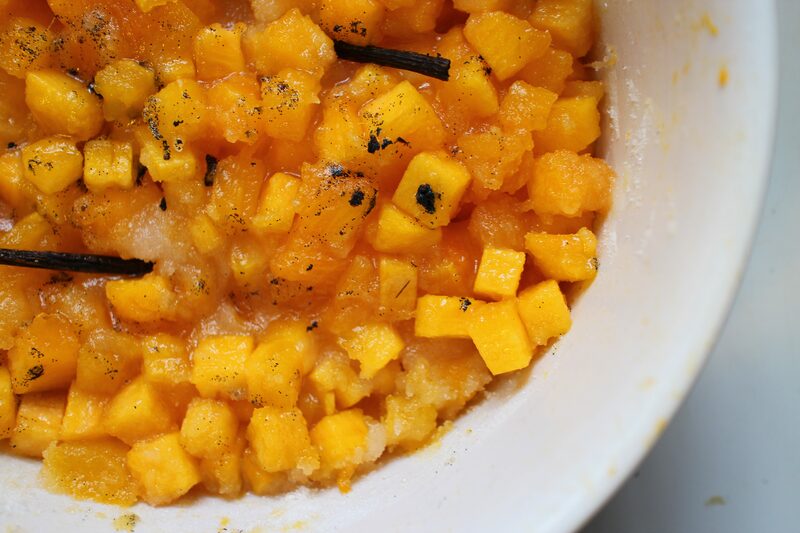 Set the squash cubes aside and discard the vanilla bean. You should have at least 2 cups of liquid. If not add a little water. Bring the liquid to a boil over medium high heat and cook, stirring, until it tests for gel (a drop added to the frozen saucer will be wrinkly to the touch), about 5 minutes. Add the reserved squash cubes and any accumulated liquid, and cook, stirring, until it tests for gel, another 3-5 minutes. Add the rum right at the end, stirring. Ladle into hot jars, remove any air bubbles with a chopstick, seal the jars with two-piece lids and process them in water bath for 10 minutes after the water comes to a boil. Turn off the heat, remove the lid and let sit for 5 minutes before removing to a counter to sit undisturbed until cool.